What makes a winner - in business or in sport? Why do some people consistently break sales targets, cross the line first or hammer the ball in the net with pinpoint accuracy? Natural talent and disciplined training are vital. But with two equally matched professionals, something else makes the difference that provides that extra, champion factor: the mind. Mind Games looks into the mental processes of sporting stars, identifying the attitudes and approaches that enable them to achieve peak performance, every time, and applies them specifically to the world of business. What are the key mental characteristics that make some people come out on top? How do winners channel adrenalin into controlled power while losers choke? What do sportsmen and women mean when they talk about 'the inner game', being 'in the zone' or being 'in the now'? What is it that coaches do to realise the potential they see? What are the lessons that business winners need to learn from sport's superstars? 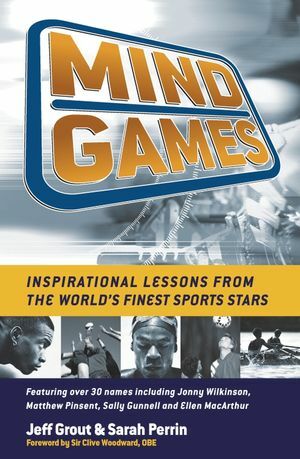 Mind Games has the full involvement of over 30 sporting household names, including Sven-Goran Eriksson, Matthew Pinsent, Clive Woodward, Nick Faldo, Jonny Wilkinson. The authors draw on extensive first-hand experiences of acknowledged sporting champions across a range of sports, identifying personal techniques proven to have worked under the pressure of top-level competition. They also draw on the expertise of professional coaches and psychologists who have worked with sportsmen and women. Jeff Grout is an adviser, commentator and columnist on the subjects of motivation, peak performance, people management, teamwork, recruitment and retention. He is also business manager to Sir Clive Woodward OBE, the former England Rugby Coach. Sarah Perrin is a freelance journalist and writer, contributing regularly to business and professional magazines. She is co-author of Kickstart Your Career and Recruiting Excellence, and author of The Guardian Careers Guide to Accountancy. She is also a qualified NLP practitioner, a technique increasingly used by sporting champions. Foreword by Sir Clive Woodward OBE. Chapter 4: The Success Magnet. Chapter 8: Anchors and Triggers. Chapter 9: Preparing for Pressure. Chapter 10: Review and Revise. Chapter 13: The Rock of Routine. Chapter 15: Into the Zone. Chapter 16: Focus and Refocus. Chapter 17: The Right Combination.